The Eighteenth Judicial District Commission on Judicial Performance unanimously recommends that Judge Theresa Michelle Slade BE RETAINED. 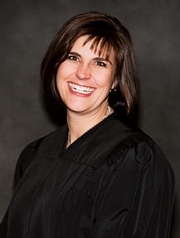 Judge Slade earned her undergraduate degree from Colorado State University and her Juris Doctorate degree from the University of Denver Sturm College of Law. Prior to becoming a judge for the 18th Judicial District, Judge Slade began her career as a Deputy District Attorney for the 18th Judicial District, and she built a private practice that focused on criminal, juvenile defense representation, and dependency and neglect cases. Judge Slade also served as a guardian ad litem. Judge Slade’s prior judicial experience included a position as a magistrate judge for the 18th Judicial District and a part time associate judge for the City of Lone Tree and the Town of Castle Rock. Judge Slade volunteers extensively in her community. For example, Judge Slade is involved in the Girl Scout Mentoring Program, she also volunteers her time and experience for high school mock trial competitions throughout the metropolitan area, and she is actively involved in her children’s career day and constitutional day at school. Judge Slade also lectures to judges, lawyers, and law students periodically on an assortment of legal issues. The commission conducted a personal interview with Judge Slade, reviewed opinions she authored, observed her in court, and reviewed surveys sent to attorneys and non-attorneys. Among the survey questions was “how strongly do you recommend that Judge Slade be retained in office?” Of attorneys responding to the survey, 70% recommended retaining, 19% not to retain, and 11% made no recommendation regarding retention. Of non-attorneys responding to the survey, 58% recommended retaining, 26% not to retain, and 18% made no recommendation regarding retention. (These percentages may not total 100% due to rounding). Judge Slade presently presides over a domestic docket. Based on the survey results of attorneys, Judge Slade received an overall combined average rating slightly below the average combined rating of all district court judges standing for retention. Of the non-attorneys surveyed, Judge Slade received an overall combined rating lower than the average combined rating of all district court judges standing for retention. Judge Slade received below average marks in case management, application of knowledge of law, communications, and demeanor from attorneys surveyed. And among non-attorneys, Judge Slade received below average marks on each of the above referenced categories. Though Judge Slade’s scores were concerning, the Commission is cognizant of the steep learning curve for a new district court judge. Judge Slade accepts full responsibility of her lower than average scores and is proactive in improving her performance on the bench. In addition to an improvement plan, Judge Slade will continue to voluntarily participate in periodic video recording to assess her courtroom demeanor, seek guidance from senior judges when necessary, and improve her understanding of the law by continuing to do her own research and writing. The Commission is grateful for Judge Slade’s dedicated service and is confident that Judge Slade will solidify her position with the 18th Judicial District.